Bringing with him his experience when Tacloban was devastated by supertyphoon Yolanda(with international name Haiyan), City Mayor Alfred Romualdez talked before a gathering held at the Singapore Lee Kuan Yew School in Singapore on April 2,2014. 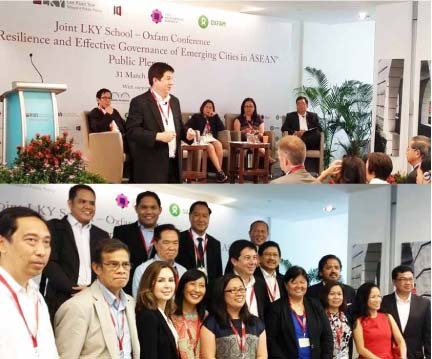 During the gathering, Mayor Romualdez shared some insights the experience of Tacloban due to Yolanda to the participants of the Lee Kuan Yew School of Public Policy and OXFAM on Building Resilience & Effective Governance of ASEAN emerging cities. With the mayor were his wife, Councilor Cristina G. Romualdez; cousin Benguet Mining president Benjamin Philip Romualdez and some mayors. TACLOBAN CITY-This city’s economy is slowly getting back on its feet, over six months after it was hit by Supertyphoon Yolanda as several business establishments are starting to reopen again. 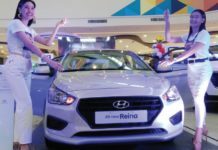 In fact, the target collection of P30 million for the first quarter of the year was surpassed by over P10 million, records from the Business License and Permits Office (BLPO) has indicated. From the months of January up to March of this year, the BLPO which is an attached office of the City Treasurer’s Office reported of revenue of P40.58 million. “Our economy is slowly getting back. Several business establishments have started to reopen again after (Tacloban) was hit by Yolanda last year,” Zosima Cordano, city treasurer, said. However, the income generated by the city government covering the first quarter of the year is relatively lower compare to same period of last year which was P86.16 million. The revenue generated by the city government for the first three months of the year represents about 1,820 businesses. Before Yolanda, the City Treasurer’s Office approved 12,900 businesses. Cordano had earlier reported that only 20 business establishment has renewed their licenses last January, the first month of the year for business renewal. For this year, the office of Cordano has only projected of about P150 million generated from its tax and business collection which was a far cry from its pre-Yolanda collection of P400 million. 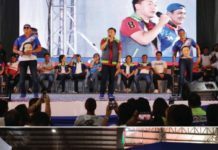 Aside from low collection from the business operators in the city, Tacloban’s income was further reduced by P8 million from its share from the national government in the form of internal revenue allotment (IRA). The reduction of P8 million of Tacloban’s IRA share was due to the creation of San Pablo in Laguna as a new city. “It’s a very big amount considering that our own local income had also reduced (significantly),” Cordano said. Before the reduction of P8 million, Tacloban received an IRA share of P478.5 million in 2013. Cordano appealed to businessmen in the city to return to business, five months after Tacloban was ravaged by Yolanda. This call of the city official appeared to have been heeded by some local businessmen.